Description: Slowly heading out of town, triling in the lead power on a southbound stack train. Description: With a touch of Espee passing directly under! Description: A nice, clear shot of a old Espee. 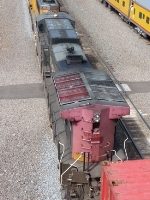 It looks like one of the folks onboard the stopped Froniter Day's Train was also taking in a shot of the old unit. Description: SP shoving a UP on the MP. Description: UP 6197 (ex-SP 373) is the third of four units on a southbound Union Pacific loaded grain train at Janesville, Wisconsin on July 25, 2013. Description: An Ex. Southern Pacific AC44CW. Description: Built as SP 373 in 1995 as part of SPs final locomotive order. Description: Built as SP 373 in 1995 as part of SPs final locomotive order. Admittingly far from a "great" photo. UP 6197 not pictured here but was the final trailing unit. Description: UP 7877 leads a westbound intermodal train trough Rochelle, IL. Description: CP 8876 (Vancouver Olympics) sits with a gaggle of power that all came in on NS 168. Currently sitting north of the A.O. Smith Yard in Granite City, Illinois. 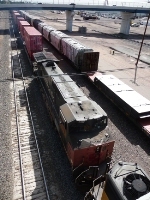 Description: Ex Southern Pacific parked near the Jenks Shop in North Little Rock, Arkansas.